Quality tarps at discount prices. 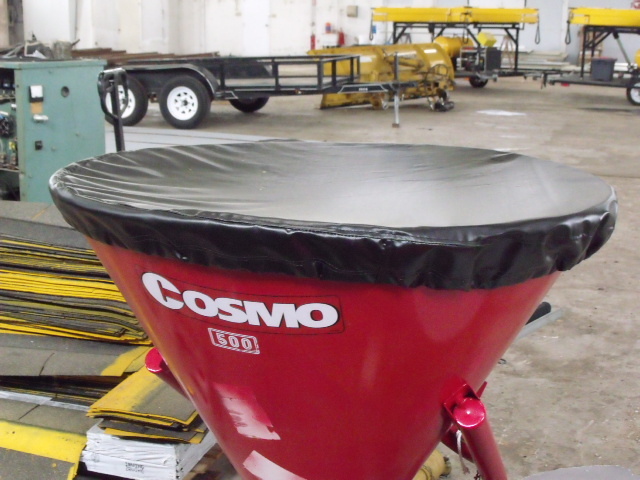 These are drawstring secured tarp covers for fertilizer hopper, broadcaster, buggies or salt spreaders. Each is individually crafted to fit your specific machine. They are made out of 18 oz. coated nylon, fitted with reinforced corners. All have a 4" to 6" side drop and are available with eyelets or dee rings spaced to give you a good pull down. Each comes with 1/4 inch nylon rope. Good looking, tough, and made in the USA. We ship to all 48 states and UPS delivery is included in the price. All covers come with 1/4 inch nylon rope. 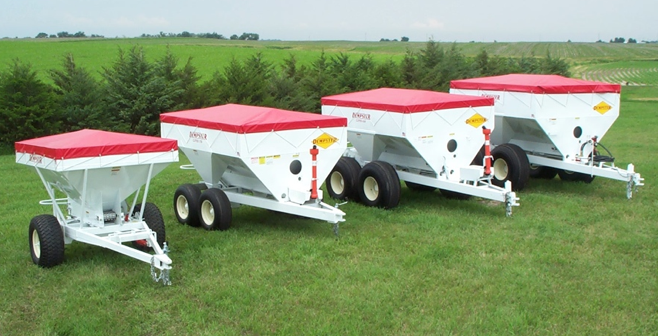 Remember - We can fit any brand and any size spreader! Round 48" diameter cover with a drawstring on a COSMO 500 broadcaster - Total: $114.00 delivery incl. Salt spreader covers, fertilizer spreader covers, salt tarp tops, salt covers, weather protection for salt spreaders, canvas covers for salt spreaders, canvas for salt hoppers, salt hopper tarp top cover, fertilizer hopper covers, salt broadcaster covers, salt weather protection. Lace on tarp covers, heavy duty salt cover. SALT COVERS. HEAVY DUTY SALT TARP COVERS. SALT BROADCASTER TARP COVERS, LACE ON COVERS. WEATHER PROOF SALT COVER TARP. AIRPORT SALT HOPPER TARP COVERS. weather proof salt covers. salt broadcaster tarp covers. SALT SPREADER TARP COVERS, SALT HOPPER COVERS, WEATHER PROOF HOPPER COVERS, HEAVY DUTY SALT TARP COVERS,. SNOW COVERS FOR SALT SPREADERS, SNOW TARPS FOR SALT HOPPERS, SALT SPREADER SNOW COVERS, SALT SPREADER SNOW TARPS, SALT HOPPER SNOW COVERS, SALT BROADCASTER SNOW COVERS, HEAVY DUTY SALT SPREADER SNOW TARPS.. The C-C Ranch wants to be your source for Agricultural tarps. These covers are available in a variety of colors and are a necessity to protect your valuable fertilizer from the wind and rain. We can provide you with an online purchase or fax or mail you an invoice.